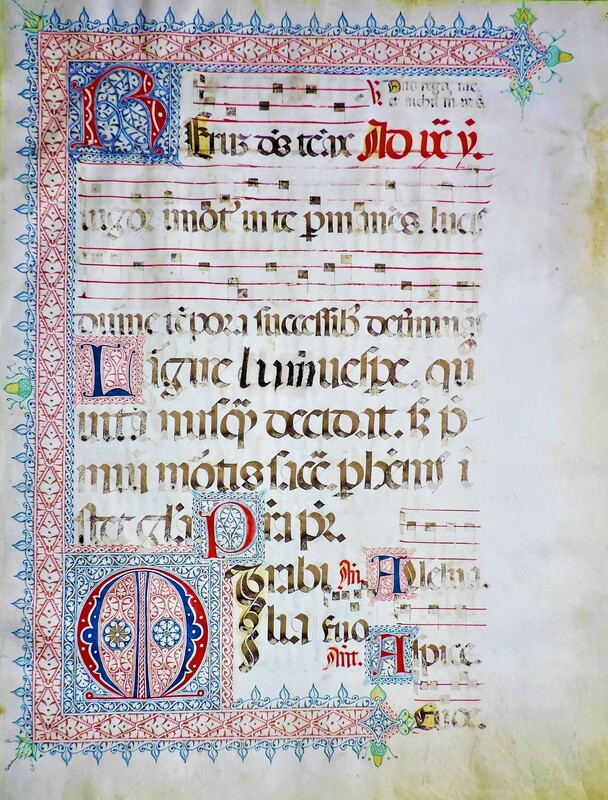 Grand illuminated Antiphonal with Astonishingly Complex and Detailed Penwork Manufactured with a Compass. Single folio on vellum. Italy, ca. 1500: 610 mm x 435 mm. Single column, 11 lines of text (12 on verso). Four-line staves in red (35 mm), three complete and three partial staves on the recto. 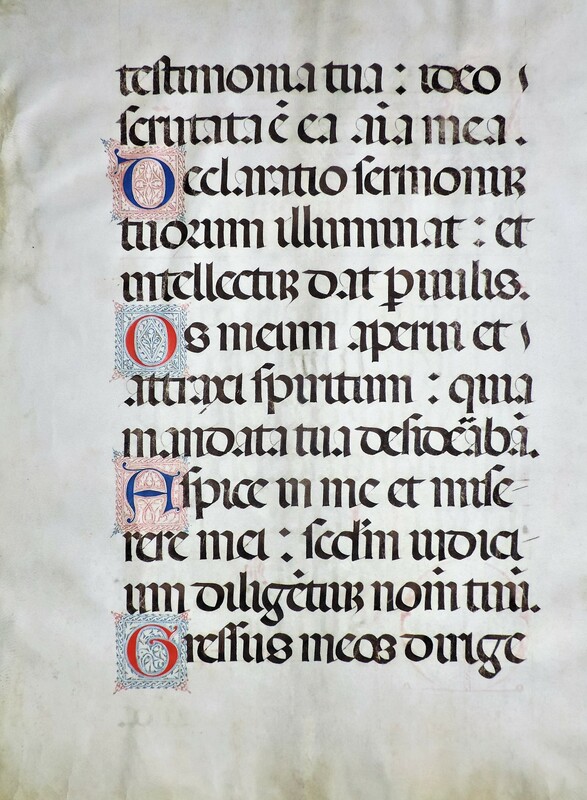 Foliated “53” in modern pen the upper right-hand corner of the recto. A correction of three letters on the recto. Decoration: on the recto one large red and blue puzzle initial (112 mm x 113 mm) with astonishing liquid gold details, including knotwork; a staff-high initial in red with blue penwork and liquid gold highlights; eight large one-line initials in red and blue with contrasting penwork; an intricate three-quarter page border in red, blue, green, and gold, with acorns and blossoms; capitals with albumen wash; rubricated. The decoration was clearly made with straight-edge and compass (pin-prick holes visible). Text: hymn for None, inc. “Rerum deus tenax vigor,” followed by Psalm 118.129 Mirabilia testimonia … 118.133 Gressus meos. This is the standard ninth division of Ps. 118. Condition: some slight ink fading; minor thumbing in lower right-hand corner; trivial creasing; matted.